$25.00 for a weekend pass. Note: Ages 17 and under: free. Tickets may be purchased through Feb 28, 2019 at www.rutabaga.com or at Rutabaga. At Canoecopia, tickets can be purchased with cash or check only. Dan is a lifetime paddler, beginning when he learned canoeing basics with the Boy Scouts. In college Dan learned to whitewater kayak and he's been an avid river runner ever since. While he enjoys all types of paddling, his favorite trips are multiday whitewater runs on wild rivers of the West. 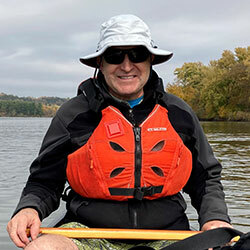 Closer to home Dan enjoys kayaking on Wisconsin's many fine whitewater runs as well as flatwater canoeing and occasional sea kayaking with family and friends. Dan has been a kayaking and canoeing instructor with Rutabaga Outdoor Programs since 2003. He also is an active leader with UW-Madison Hoofers, a paddling and outdoor recreation club. He's trying to make up for lost time in college when he somehow spent more time studying than paddling. Whitewater paddling has an image problem. It's seen as an extreme sport practiced by 20-something adrenaline junkies hurtling off huge waterfalls. The truth is that whitewater can be enjoyed by a wide range of paddlers. There is a world of wonderful rivers with modest rapids that pose minimal risks. In this presentation Dan York will show the peace - even calm - that can be found on rapid rivers. Whitewater is not just for thrill-seekers, but for any paddler wishing to explore wild rivers and enjoy the dance of flowing water. Wild western whitewater rivers are the stuff of paddling dreams. They offer river runners the chance to paddle multiple days through spectacular landscapes of mountains, canyons, forests and deserts. The rivers are as varied and distinct as the western landscapes themselves. In this presentation Dan York will share images and experiences from paddling several premiere and pristine western rivers. The rivers included in this presentation span the wide variety of western rivers, including the Flathead, Salmon and Selway rivers of the northern Rockies, and the Yampa, Colorado, Salt and Green rivers of the desert Southwest. Choices of river travel also vary: raft-supported or self-contained? Commercial or private? York will discuss these options and their advantages and disadvantages. Paddling and camping on western wilderness rivers are amazing experiences that anyone can do. York's presentation will inspire you to seek out your own western adventures and guide you on how to make your own western paddling dreams come true. Tickets may be purchased through Feb 28, 2018 at www.rutabaga.com or at Rutabaga.